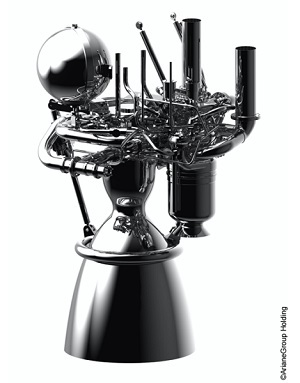 A NASA technologist is taking miniaturization to the extreme. 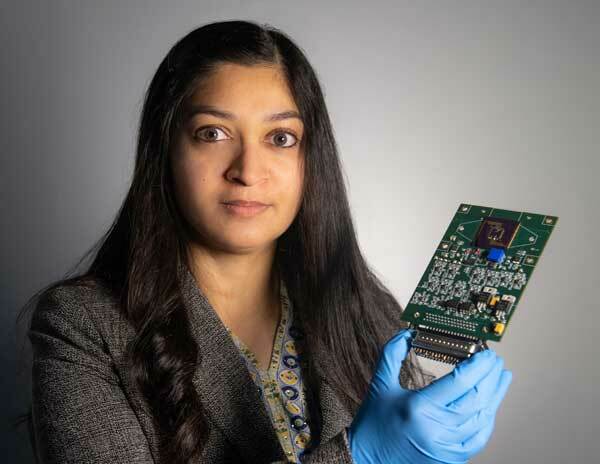 Mahmooda Sultana won funding to advance a potentially revolutionary, nanomaterial-based detector platform. The technology is capable of sensing everything from minute concentrations of gases and vapor, atmospheric pressure and temperature, and then transmitting that data via a wireless antenna — all from the same self-contained platform that measures just two-by-three-inches in size. 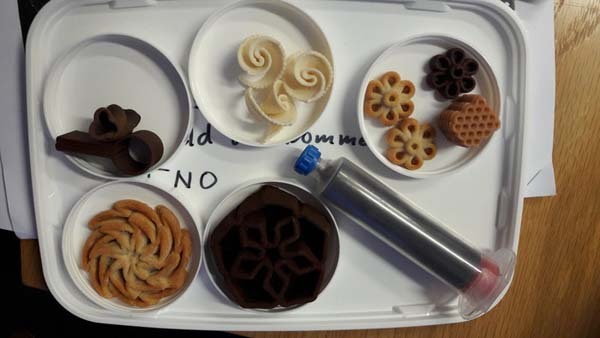 MOSCOW (Roscosmos PR) — INVITRO, a leading medical company, and 3D Bioprinting Solutions biotechnology laboratory announced a successful completion of the first stage of the Magnetic 3D Bioprinter space experiment. On December 3, 2018, the Organaut bioprinter was delivered to the ISS on board the Soyuz MS-11 manned spacecraft. 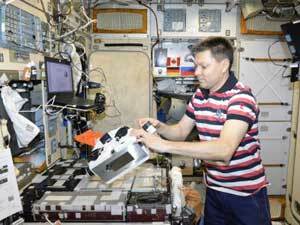 For the first time on orbit, cosmonaut-researcher Oleg Kononenko printed human cartilage tissue and a rodent thyroid gland using a Russian bioprinter. The Organaut was already aboard the Soyuz MS-10 spacecraft on October 11, 2018, but its crew returned to Earth 20 minutes later after an emergency situation. The bioprinter landed in the habitation module and was significantly damaged by overload. The backup was prepared and the crew’s repeated training was organized in the shortest possible time. Luxembourg/ Bremen (G), 15 October 2018 (Kleos Space PR) — Luxembourg-based and ASX listed Kleos Space S.A. (ASX:KSS), state-of-the-art space technology operator, today announces the signature of a second Memorandum of Understanding with Airbus Defence and Space, as both companies investigate opportunities to collaborate for the manufacture In-Space of structural elements. 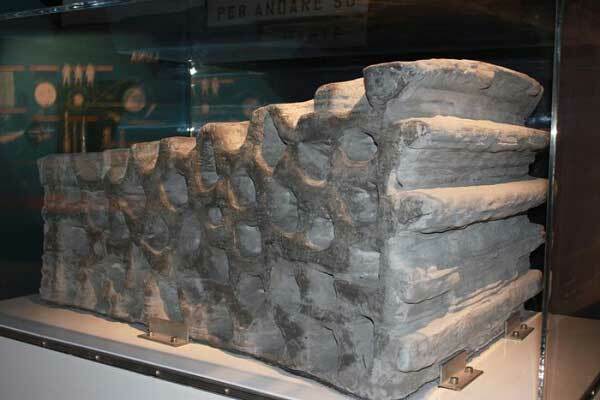 Kleos Space and parent Magna Parva (UK) have developed an In-Space manufacturing system that will provide a method of producing huge carbon composite 3D structures in space. LUXEMBOURG CITY, LUXEMBOURG September 27, 2018 (Made in Space PR) – Made In Space, Inc. (MIS) to open a new facility in Luxembourg which will enable the company to more easily serve its European customers. MIS’s Luxembourg operations will focus on bringing low-cost robotic systems to the European market. Luxembourg was a strategically chosen location due to its proximity to both excellent robotics talent and successful European aerospace companies. HARWELL, UK (ESA PR) — 3D-printed metal parts produced through a Europe-wide collaboration of high-performance industrial sectors have undergone extensive testing for space use – tested to destruction in many cases – by ESA’s specialist advanced manufacturing lab in the UK. 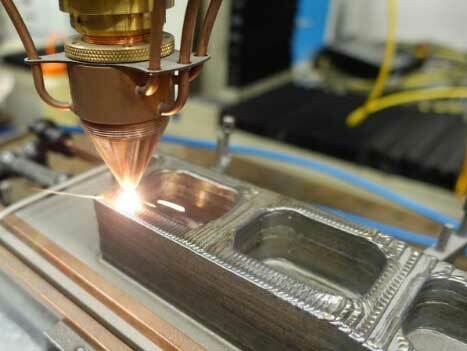 ESA’s Advanced Manufacturing Laboratory based in Harwell, UK, took delivery of the sample parts, produced as an output of the four-year AMAZE programme, harnessing metal 3D printing to produce lighter, cheaper, better products. COLOGNE, Germany (ESA PR) — Lunar masonry starts on Earth. European researchers are working with Moon dust simulants that could one day allow astronauts to build habitats on our natural satellite and pave the way for human space exploration. The surface of the Moon is covered in grey, fine, rough dust. This powdery soil is everywhere – an indigenous source that could become the ideal material for brickwork. You can crush it, burn it and compress it. Team SEArch+/Apis Cor of New York is the fourth-place winner in NASA’s 3D-Printed Habitat Challenge, Phase 3: Level 1 competition. PEORIA, Ill. (NASA PR) — NASA and partner Bradley University of Peoria, Illinois, have selected the top five teams to share a $100,000 prize in the latest stage of the agency’s 3D-Printed Habitat Centennial Challenge competition. Winning teams successfully created digital representations of the physical and functional characteristics of a house on Mars using specialized software tools. 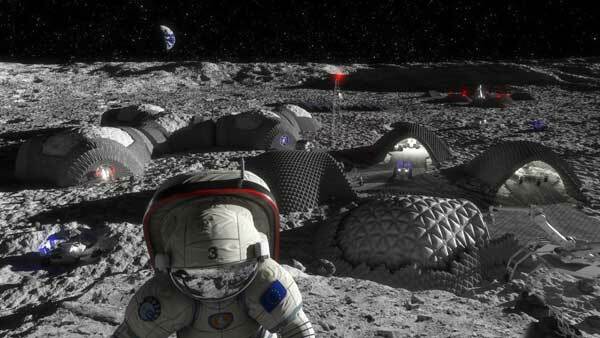 What Would You 3D Print on the Moon to Make it Feel Like Home? BOTHELL, Wash. (Tethers Unlimited PR) — Tethers Unlimited, Inc. (TUI) announced that it has successfully delivered the Refabricator payload to NASA in preparation for launch to the International Space Station (ISS) later this year. 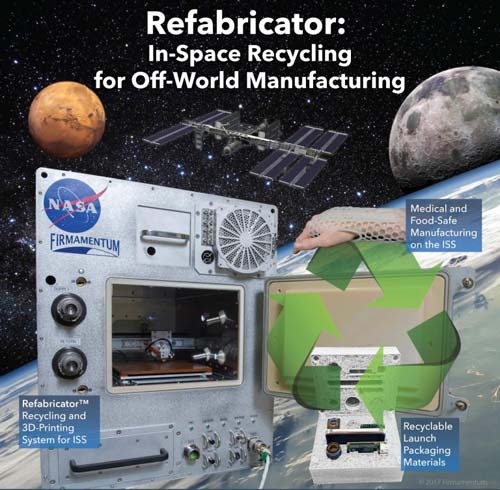 The Refabricator is a mini-fridge sized experimental payload that combines a plastics-recycling system with a 3D printer. NASA will use this payload to demonstrate the ability for astronauts to recycle plastic waste and use the material to create new parts and tools to support long-duration manned missions to the Moon, Mars, and deep space. 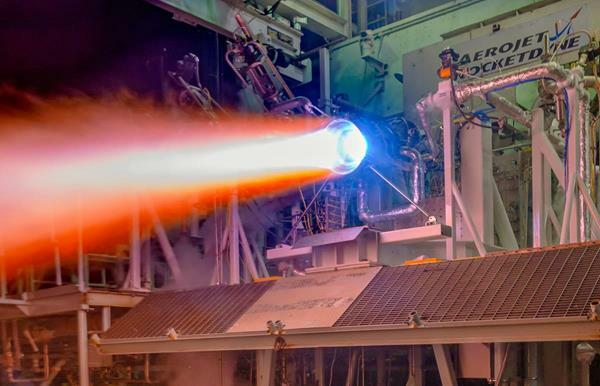 Masten Space Systems of Mojave will pursue a project designed to better use additive manufacturing (AM) in the production of rocket engines with the help of NASA funding. The space agency selected the company’s PermiAM project for funding under its Small Business Innovation Research (SBIR) Phase 1 program. The contract is worth as much as $125,000 over 13 months. 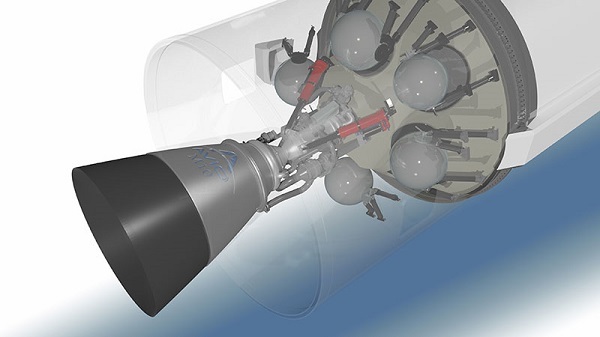 “Part of the work performed in this SBIR will help in determine the potential savings for future engine development programs, currently projected at 10x for injector build cost savings which require face cooling,” the project summary stated.